An update on the "Friends of Jawbone Canyon" website highlights recent route closures as a result of illegal off-highway vehicle use causing damage to private property and areas of critical environmental concern. Jawbone Canyon is a checkerboard of public and private land on the western edge of the Mojave Desert, just northeast of Tehachapi and southwest of Ridgecrest. Some of the public land is designated as protected under the Jawbone-Butterbredt Area of Critical Environmental Concern (ACEC). In partnership with private landowners and the Bureau of Land Management (BLM), dozens of miles of OHV routes were opened to the public to enjoy the natural splendor of the area. An unlawful few, however, began to create new routes, irreparably harming undisturbed land, natural springs, and even cutting private fences. Some routes have been closed as Friend of Jawbone (FOJ) Canyon works in partnership with Kern County and the BLM to restore damaged lands. 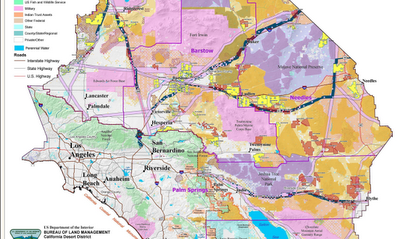 The Twentynine Palms Marine Base released a draft Environmental Impact Statement (draft EIS) for its proposed expansion, which would put over 146,000 acres of the Johnson Valley Off-Highway Vehicle (OHV) area under military control for live-fire exercises. The military has reportedly met with OHV groups to work out arrangements that give OHV users access to part of the exercise area when it is not being used by the military. As a result, the Marines' preferred alternative would let OHV users access a portion of the area during 10 months out of the year. The Federal government is currently reviewing a broad policy shift that could encourage solar energy development on thousands of square miles of pristine public land in America's deserts, according to its Draft Programmatic Environmental Impact Statement (Draft EIS). Unfortunately, the new policy fails to consider a much better alternative, which is to encourage solar energy development on rooftops and on already-disturbed lands. After a summary of the policy's potential impacts, you can read below to learn how to submit public comments on the policy as a concerned citizen, and urge a smarter approach. The Departments of Interior and Energy are jointly reviewing three alternative policies for permitting solar energy on public land. Each alternative makes a different amount of public land available to energy companies, but the government estimates that companies will use 214,000 acres (334 square miles) within 20 years. The editorial below was jointly authored by the Sierra Club, NRDC, and Wilderness Society in response to wayward government policy that could needlessly sacrifice hundreds of square miles of pristine desert to solar energy development. These groups are finally showing much needed leadership on a vexing issue -- that not all renewable energy is "green." I explore the issue in more depth in "Green vs. Greed." I've written a lot about energy companies rushing to build massive solar facilities in America's deserts --mostly on pristine habitat that is home to a variety of rare plant and wildlife. Wind projects also threaten these ecosystems, including the proposed Searchlight Wind project to be built by Duke Energy in Nevada. Even though wind energy projects may not require as much ground disturbance as solar energy facilities, the spinning blades have been proven to kill rare bat species, golden eagles, vultures, and other birds. The Searchlight Project, near the town of Searchlight, would place up to 160 giant wind turbines on up to 14 square miles of public land. At least 40 miles of new roads will scar the area to reach each turbine. Basin and Range Watch has covered the proposal extensively on its website, and they also provide some beautiful photos of the area. The Mojave Desert is receiving another round of rain showers tonight, with chances of rain forecast for next week, as well. Readers of this blog and residents of Southern California will remember the nearly 5 days of rain showers that pounded the desert in late December, setting the stage for a potentially great wildflower season this spring. Todays rains could improve our chances for a good show. 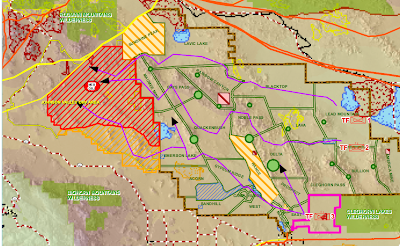 Tessera Solar LLC recently sold its rights to build the Imperial Valley Solar project on over 10 square miles of pristine desert to AES Solar. Tessera Solar received approval by the Federal government last year to build the solar facility on the vast tract of public land that also contains threatened species and hundreds of sites of cultural significance to the Quechan Tribe, but Tessera did not have the money to build the project. The Quechan tribe filed a lawsuit against the Federal government for approving the project without understanding the cultural resources that would be destroyed, and a judge ruled in December that the government likely failed to properly consult with the tribe, ordering a halt to any construction plans. AES Solar will not be able to build on the site until the case is resolved, which could take years. Who Should Lead Our Renewable Energy Policy? The Department of Interior plans to make millions of acres of mostly pristine desert land in America's southwest available to energy companies as part of its solar energy development proposal. Much of this energy development will take place in California's deserts, and threatens to drive rare plants and wildlife to extinction. The light is shining so brightly on Interior's misguided proposal that we have forgotten a promising effort by the Environmental Protection Agency (EPA) to build renewable energy on already-disturbed land instead of our treasured open space. 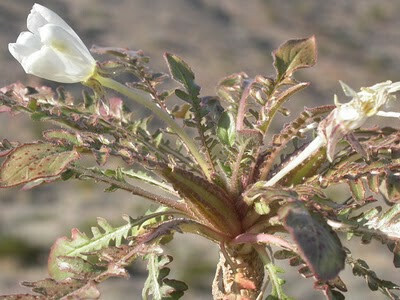 The cavedwelling evening primrose (Oenothera cavernae), a rare desert forb, was discovered in the Ivanpah Valley in 2006, and it is still being studied by botanists. Desert experts continue to discover new species of plants and reptiles in California's desert, so it is understandable that citizens are concerned about Federal government and energy company plans to bulldoze hundreds of square miles of the Mojave and Sonoran Deserts, likely wiping out undiscovered or little-understood species. 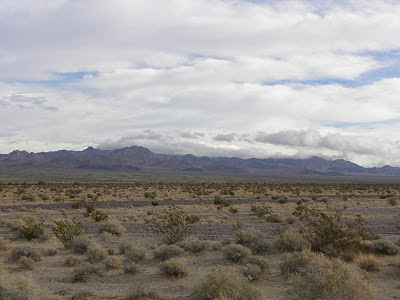 Energy companies plan to destroy over 20 square miles of pristine desert habitat in the Ivanpah Valley to build three solar facilities--Stateline and Silver State by First Solar Inc, and ISEGS by BrightSource Energy. Some environmental organization shave asked developers to move such projects to land that is already disturbed or, better yet, distributed generation (rooftop solar). Southern California Edison announced this month a plan to buy solar power from First Solar Inc.'s proposed Silver State South solar project. The "power purchase agreement" gives the solar energy company more confidence that its project would be economically viable. 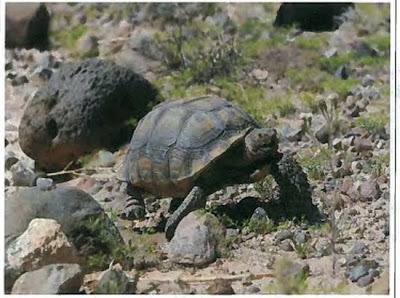 However, the Silver State South project is proposed for an ecologically important area of the Mojave Desert known as the Ivanpah Valley, which is home to an abundant and thriving desert tortoise population, according to biological surveys of the area, even though the species is declining in the rest of its range. Biologists have also discovered a new plant species in the area. K Road Power, the company that purchased the rights from Tessera Solar to build the proposed Calico Solar power project, recently told the Desert Dispatch that they could begin bulldozing the site as early as August. The Calico site is one of several locations poorly chosen by energy companies for solar development, and is home to a high density population of desert tortoise and a pocket of rare plants found in only a few other spots in the world. The Sierra Club filed a legal challenge against the State of California for approving the project on such ecologically important land. K Road Power (and its subsidiary, K Road Solar), expect to change the original plan of development to use fewer of Tessera Solar's "Suncatcher" dishes, and more photovoltaic panels. The change in technology almost certainly will necessitate a new environmental review because of differences in ground disturbance and water flow during rain storms. The California Energy Commission (CEC) rejected a petition by the Center for Biological Diversity (CBD) opposing the Palen Solar power project. The CEC approved the project, proposed by Solar Millennium LLC for nearly 8 square miles of the Chuckwalla Valley, in December. CBD argues that the CEC violated California law when it approved the Palen Solar project before the Department of Interior gave its final approval to the project, which will have direct and indirect impacts on critical habitat and wildlife management areas. The Commission is under immense political pressure to favor energy companies in its decisions, and has been heavily criticized for bending and breaking laws to permit fast-track solar power projects. Over the past week, two major court rulings were handed down that vindicate Americans demanding that the government take a wiser approach to land use in California's deserts. In the first ruling on 29 January, Honorable Susan Illston of the United States District Court ordered the Department of the Interior to take steps that limit the impacts of off-road vehicle (ORV) recreation on public lands in the West Mojave. The judge ordered the Department to study and designate new off-road vehicle routes by March 2014, clearly mark routes that are legal for off-road use, monitor the land for signs of illegal ORV use, and provide sufficient enforcement capacity. ORV use--if not probably checked--causes severe degradation of desert habitat through collisions with endangered species such as the desert tortoise, and the compaction of desert soil that prevents plants and wildflowers from thriving, impacting the entire food chain.